Growing up in the South means a hearty breakfast consisted of sausage, gravy, egg, biscuits, toast, bacon, hashbrowns, etc!!! But, in our chosen meatless and less-dairy lifestyle, sometimes that craving for an old-fashioned Southern breakfast just beckons, and this morning, did we ever answer its call! Thick, chunky “sausage” gravy made with Light Life’s Gimme Lean sausage was exactly what I wanted for brunch on this sunny Florida Sunday. I also made simple drop biscuits with soy milk and vegan butter. My husand had about 5 biscuits. But I, the one trying to shed pounds, only had 2 and a dollop of gravy :-) I think they look lovely sitting on the pretty plates my sweet mother-in-law bought for us. 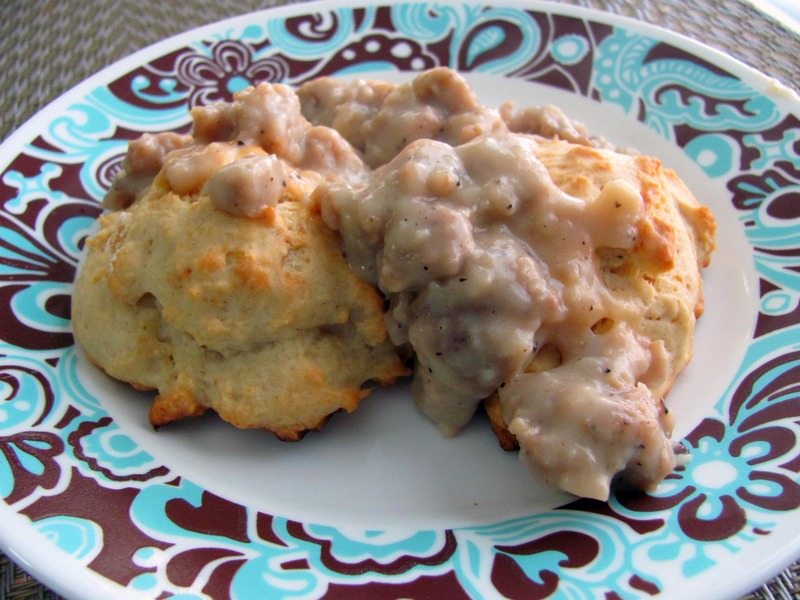 I suggest preparing the biscuits first, popping them in the oven, then preparing the gravy on the stove top. That way they are pretty much done at the same time. Preheat oven to 440 degrees. Combine all ingredients together in a medium mixing bowl. Spray a cookie sheet with nonstick cooking spray. Drop dollops of biscuit dough onto cookie sheet and bake for 15 minutes, or until biscuits are browned on the top. Makes about 12 biscuits. Heat oil in a medium skillet on medium/medium-high heat. Break apart the sausage as best you can and start browning it in the skillet. As it starts to cook, it will become easier to chop into small pieces. When the sausage is browned, dash a little flour on it to dry up some of the olive oil. Don’t dash too much – just enough to soak it up. Then, add 1 1/2 cups soy milk and let it start to simmer. Once it starts to simmer add 1/4 cup flour and mix well. I prefer my gravy super thick, so I usually add a lot more flour and then continue to adjust it by either adding flour or soy milk until it is the consistency I want. Once you get it to the consistency of your liking, add black pepper and stir well to mix.